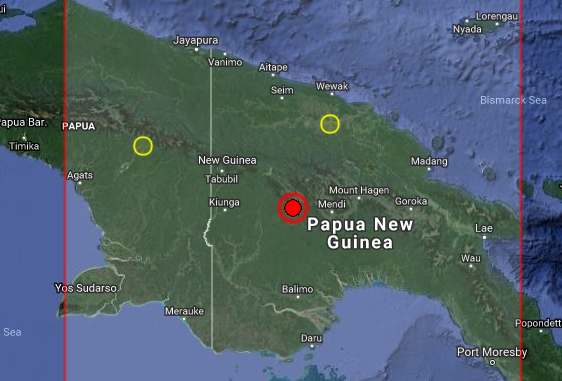 A powerful punch of 7.5R has just struck in Papua New Guinea. As we can see from the Global Calendar below today is a hot day, as Mars is square Venus. The 7.5 magnitude earthquake struck the heart of the island near the near the Southern Highlands area, with tremors felt across the nearby region. The phenomenon hit at a depth of 10km at roughly 4am local time (6pm GMT). It is currently unclea rif any damage or injuries were cause by the substantial siesmic event. Papua New Ginuea rests on the so-called 'Ring of Fire' – a hotbed of seismic activity surrounding a tectonic plate that spans the pacific. The quake follows another seismic event in Japan, where a 5.5 magintude earthquake struck just hours before. Despite the magintude of the huge quake, officials have confirmed there is no risk of a resultant tsunami. A statement from the US’ Pacific Tsunami Warning Centre said: “An Earthquake with a preliminary magnitude of 7.6 occurred in New Guinea, Papua New Guinea at 1745 UTC on Sunday February 25, 2018. “Based on all available data, there is no Tsunami threat from this earthquake."